It is nice and easy to take pictures of your fur baby, but often times those pictures never make it past your phone and they aren’t good enough to print and hang. For displaying in your home you want a professional portrait of your loved one. I wish they could stay with you forever, but their lives are short. They love hard, play hard because they know they don’t have that long to show you how much you are worth their love. 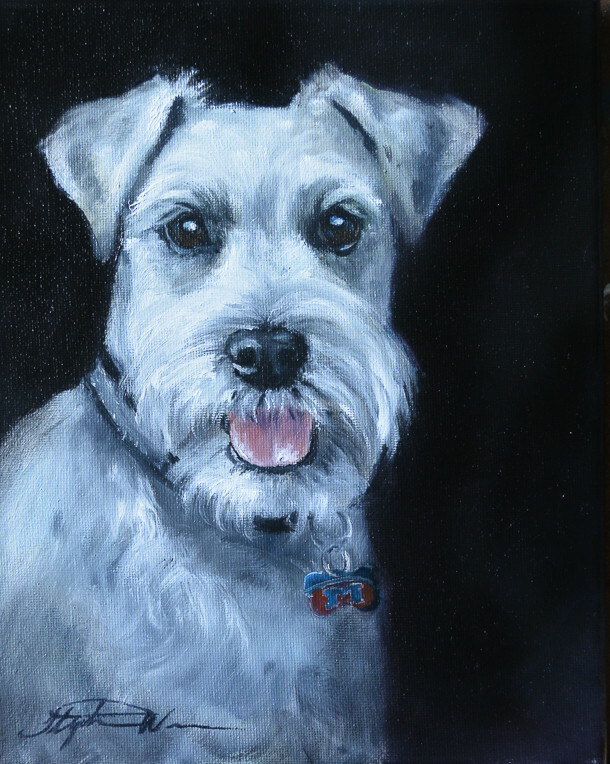 I do paint from pictures and I do paint a lot of memorial portraits; and I’ll be honest, as a fellow animal lover, there are times I’ll talk with the owner to understand the pet’s personality that we will be in tears. When I paint the pet portraits, I’ll relay their story over and over in my head and at times I will cry again. Having a pet’s portrait tastefully created is a celebration of their life. It is my intent with each of these memorial paintings to help the owner remember their fur baby’s happy face and loving eyes rather than remember those last days of life. You could purchase a print at one of the box stores that resembles your pet, but the reality is it isn’t YOUR pet. Every single animal I’ve painted is completely different, not only because their personalities, markings, expression, teeth, length of hair etc is different, but also because YOU are different. When I get the initial photos, I take the time to look at all the pictures together and take note of what expressions you provide and what the background looks like; if you go on hikes or walks or the pup likes to wear bandanas or sits in a particular chair or sits with paws crossed, one ear is generally cocked up and the other down, etc.,...these subtle details makes him/her unique. So when we talk I understand a little better the dogs lifestyle and what background colors or imagery you might want and we talk through that; for example, maybe you want the background from one photo but the positioning in different photo, maybe you want the a gray background to match the living room., etc - you won’t get that with an image purchased from a big box store. I have painted all of my pets both living and those who have passed: Peanut, Charlie, Louie, Frankie, Bacon, Sophie, Brownie, and Cookie. Peanut was my first portrait painted about 17 years ago, while my painting style has greatly improved since then, the painting itself is as if it were new. I use professional quality paint by Gamblin, non-toxic and orderless brush cleaner, Gambsol by Gamblin, and I order quality linen or Ampersand Gessobords. Once the painting is finished, I hand varnish each painting with a UV protectant 3 times. But that just speaks to the quality of my work, to also stand the test of time; a good painting must have a good composition and good technique. 5. 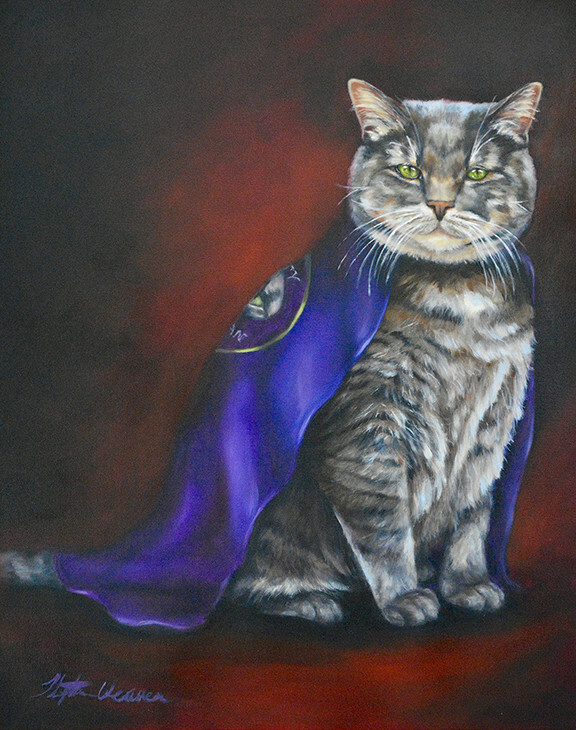 A Pet Portrait is an amazing gift. Whether the painting is for you or for a loved one, it is an amazing gift. A gift that will last a lifetime and that will bring back fond memories of not only the fur baby but also of you who took the time to give something that they didn’t even know they wanted. I have painted many paintings for guys who were giving the portrait to their wives/fiancés and let me tell you, their wives talk about it to this day and show off how thoughtful their husbands are (major brownie points...just saying...) . 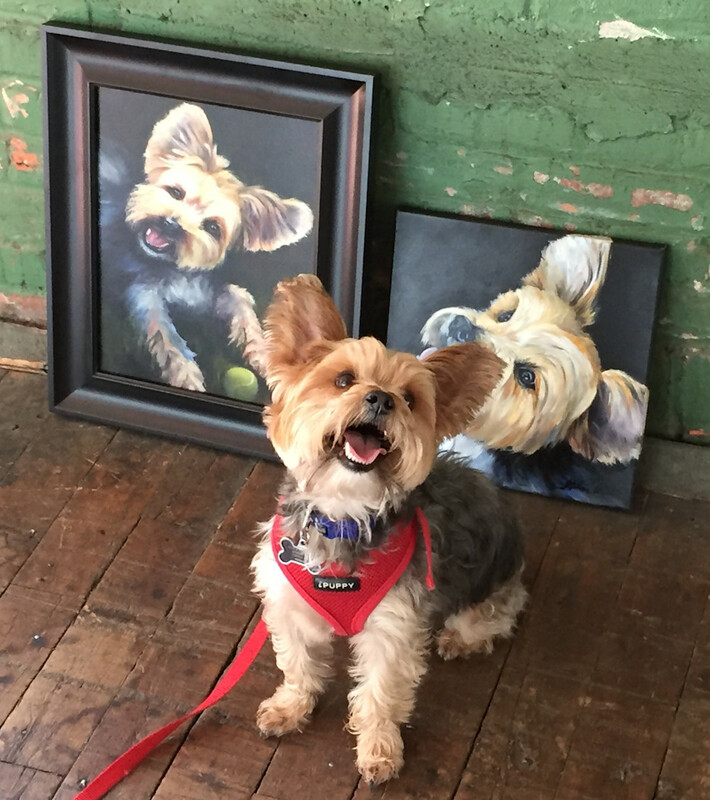 And while all of the above are great reasons to get a custom oil pet portrait and I do speak to my work as well, there is one more reason why I am set apart from a majority of artists: I give back; I give 10% to non-profit animal welfare organizations. I may paint other subjects like landscapes, still-life’s etc., but regardless of subject and price of the piece, I give at least 10% to non-profit animal welfare organizations - that is why I call myself Art Fur Paws. If you’d like a custom oil pet portrait, get in touch with me today at artfurpaws@gmail.com. I look forward to hearing more about your fur baby and seeing pictures! !